RV Giveaway | Manteca Trailer & Motorhome, LLC. 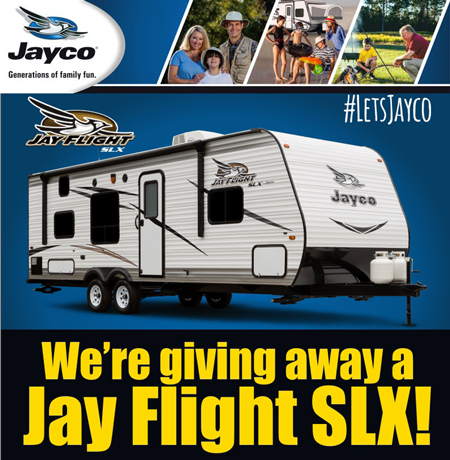 To celebrate 10 years as America's best-selling travel trailer, Jayco will be giving away a Jay Flight SLX 264BHW. Fill out the form below by September 30, 2015 for a chance to win. No purchase or payment of any kind is necessary to enter to win in this sweepstakes. A purchase or payment will not increase your chances of winning. Void where prohibited, taxed or restricted. Open only to legal residents of the 48 contiguous United States (and District of Columbia) and Canada (excluding where otherwise prohibited by law) who, as of time of entry, are at least eighteen (18) years of age or the age of majority in their state, province, or territory of residence, whichever is older. Limit two (2) entries per person per authorized account holder. Are you in the market for a new RV? I would like to receive emails from Manteca Trailer & Motorhome, Inc., about other RVs & Camping events, clubs, publications, services, and coupons. I would like to receive news and updates from Jayco.